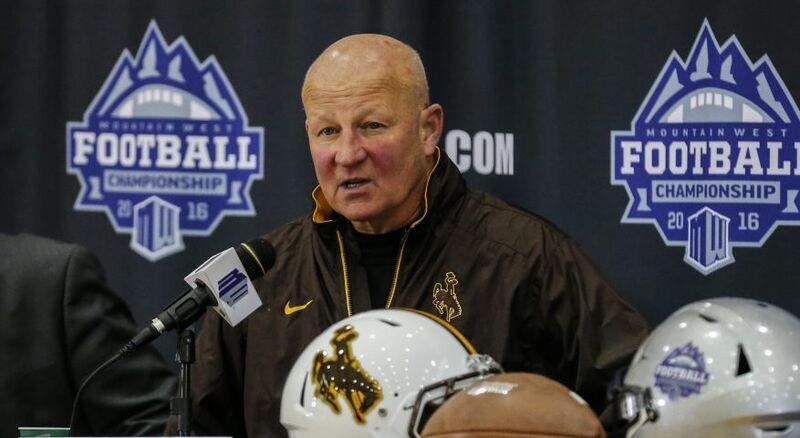 Craig Bohl has taken the excitement of Wyoming Football to a level not seen in years. Coming off their first winning season since 2011 in Dave Christensen’s third year as head coach, the excitement for Wyoming football across the state is at a level we have not seen for years. The program is settled in their fourth year under Craig Bohl and his methods have seen results on the field with a jump from 2 wins in 2015 to 8 wins in 2016. While Wyoming lost some key offensive players at the RB, WR and TE positions they return one of the most talked about players in the country in QB Josh Allen. The junior quarterback is held in high regard by the NFL scouting community and he is projected to be one of the top QB’s in the 2018 NFL draft and a potential number one overall pick. Wyoming has not seen this type of national attention in some time as the program has slogged its way through four different head coaches since Joe Tiller left the University in December of 1996. Craig Bohl has seemingly righted the ship though and the program is starting to develop depth on both sides of the ball as they look to establish themselves as annual Mountain West football title contenders. You have to go back to the late 90’s since the Wyoming football program has had this much excitement and expectation heading into a season. Coming off a 10-2 season Joe Tiller left for Purdue and Dana Dimel was brought in from Kansas State. Expectations were still high as there was talent on the roster and Dimel turned that into an 8-3 1998 season (after an 8-1 start) and a 7-4 1999 season. Dimel cashed in on that success to take the University of Houston job after the season. That brought us the Vic Koenning era in which I will not comment on because unfortunately, we all had to live through it and remember it all too well. There were some false ascents for the program under Joe Glenn but now we have seen some true success under Craig Bohl they can truly be labeled as false in hindsight. There is a strange divide in opinion on this football season when looking at internal and external sources. Wyoming should be the hunted having won last year’s division title but they still can carry a chip on their shoulder. In the recent Mountain West Media summit, the Pokes were picked to finish 3rd in the division behind Boise State and Colorado State. Boise State is the model program in the conference so that is understandable. The school to the south on the other hand, quite questionable considering the Pokes beat them 38-17 last year in a game that wasn’t as close as the score would indicate. Someone should tell the media that a new football stadium doesn’t all of a sudden make a football program better on the field. Wyoming will face new challenges in 2017 as they look to make another step forward as a football program. Wyoming shocked the conference when they won the division and hosted the conference title game after being picked last in the preseason poll. How will they handle the pressure of presumed success with a quarterback who very well could be the new face of an NFL franchise in less than one years time? Internally the pressure is there to repeat the success of last season but externally it seems Wyoming still lacks a certain amount of respect. We don’t know the answers to these questions but it’s sure going to be fun to watch things develop. This level of excitement sure beats the numerous 2, 3 and 4 win seasons the fan base has had to endure through in the recent past.